TASHKENT (Reuters) - Russia and Uzbekistan began preliminary work on Friday on the first Uzbek nuclear power plant, a project Moscow estimates will cost $11 billion. 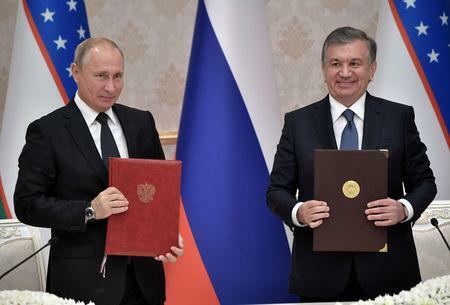 The plant, to be largely financed by a soft loan from Russia, will allow Uzbekistan to use more of its natural gas for other purposes such as chemicals production or export. 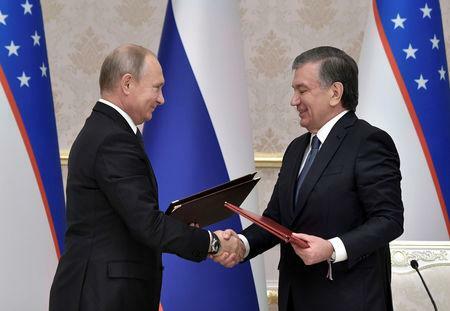 Russian President Vladimir Putin and Uzbek President Shavkat Mirziyoyev pressed a symbolic button together at a ceremony in a conference hall in Tashkent to mark the start of geological surveying to decide on a location for the facility. Uzbekistan expects to pour first concrete no earlier than 2020 because of the project's complexity. The two-block, 2.4 gigawatt plant is expected to start producing power in 2028. Today, most electric power in Uzbekistan is generated by gas turbines, but the country wants to extract more added value from its gas reserves. 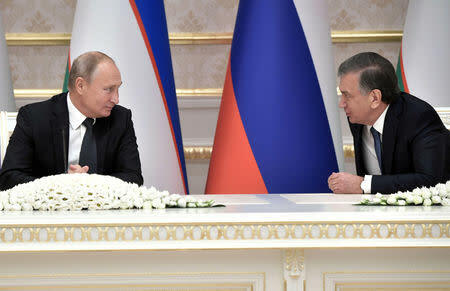 The nuclear project launch was a highlight of Putin's state visit to Tashkent, which saw the two sides also signed a number of other agreements, including in the energy sector. Russia's Gazprom signed a production-sharing agreement for the Dzhel gas field where it aims to produce about 300 million cubic metres a year at peak, a small project by the region's standards. LUKOIL, signed a memorandum on exploration work, and Russian businessman Andrei Filatov signed an agreement with an Uzbek state firm over a project to develop a gas field and build a chemical plant. Producing the same amount of energy as a nuclear power plant using modern gas turbines would consume more than 3.5 billion cubic metres of gas a year, according to Jurabek Mirzamahmudov, head of Uzbekistan's nuclear energy agency UzAtom. "This is feedstock for one petrochemicals plant which could produce half a million tonnes of polymers," he told reporters this week. Uzbekistan also exports gas by pipeline to Russia and China and the latter in particular has steadily increased energy purchases from Central Asia. Mirzamahmudov said it was possible Uzbekistan would add two more blocks to the plant in the future, doubling its capacity. So far, however, the cost is not final even for the first two blocks. Moscow has put it at $11 billion, but Mirzamahmudov said talks on the matter would start next year and Tashkent hoped the figure could be reduced.